Nick Carter is a talented American singer, musician and actor, best known as a member of the Backstreet Boys. 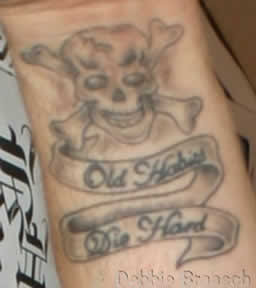 Nick Carter has quite a few tattoos scattered around his body, including the name of his ex girlfriend "Paris" Hilton on his left wrist, which is now covered up with a skull and crossbones with the phrase "Old Habits Die Hard". He has three tattoos on his back including a crescent moon and sun, a musical note and the nickname "Kaos" centered vertically on his back. 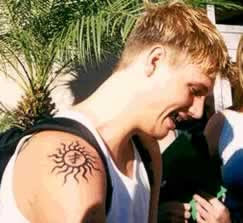 On his right arm is a tribal sun and armband along with a Chinese symbol. 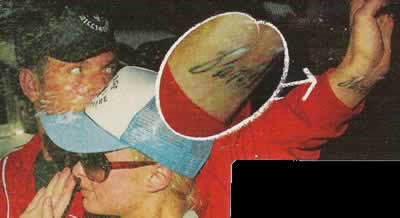 The tattoos on his left arm include a shark amongst large blue waves with three stars and two Chinese symbols. 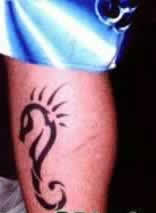 Some of his other tattoo designs include, a tribal seahorse on his left calf and another unknown tattoo design on his right calf, plus two tattoos on his chest.